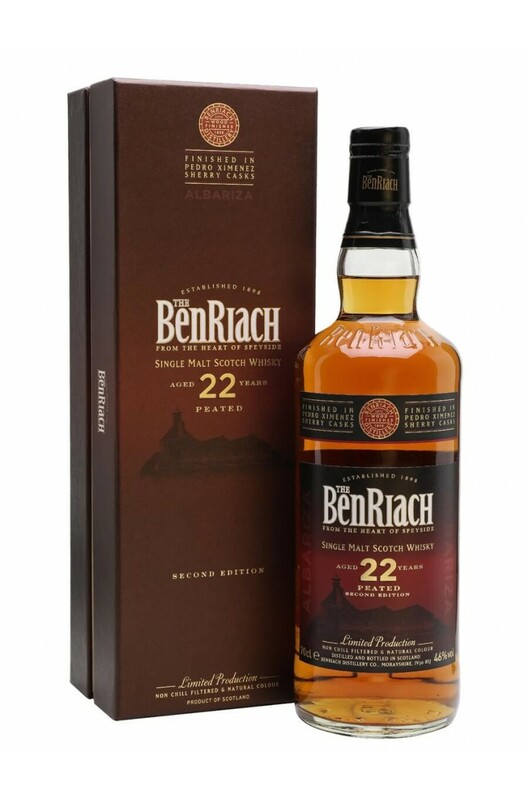 A limited release from Benriach that has been matured in American oak casks and then finished in Pedro Ximenez Sherry casks. The name Albariza comes from the white soil in Andalucia used to make Sherry. Perfectly named as it's a complete Sherry bomb! Taste A crisp sherried sweetness combines with dark chocolate, Victoria plums and rumsoaked raisins, all surrounded by an earthy,campfire smoke. Nose Warm, honeyed peat smoke holds gentle touches of garden mint infused through sweet dates and chocolate fondant. This is a special release of BenRiach which celebrates 10 years of distilling under the new ownershi.. This is a significant release of Benriach. It is the first core release made from whisky distilled a..
A superb 15 year old expression of Benriach that has been initially matured in ex-Bourbon barrels be..
Distilled from heavily peated malt and aged in traditional ex-Bourbon barrels before a finishing per..